NASA’s top human spaceflight official says the maiden flight of the Space Launch System, a behemoth booster designed to loft astronauts on expeditions into deep space, will be delayed from November 2018 until some time in 2019, according to a report published by a U.S. government watchdog Thursday. 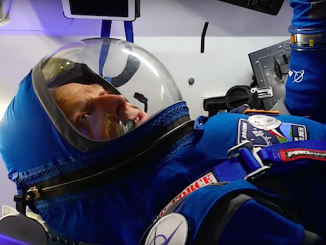 The delay is not a surprise to observers who closely track progress on NASA’s next-generation human spaceflight program, which has struggled to keep pace with a target launch date in November 2018. A missed delivery date for the European-made service module set to power NASA’s Orion crew capsule, snags in the welding of parts of the SLS core stage due to low weld strength, and a tornado that struck a production site in New Orleans were some of the major problems identified in a Government Accountability Office report Thursday. Read the GAO’s full report here. Bill Gerstenmaier, head of NASA’s human spaceflight program, agreed with the GAO’s assessment that the space agency should set a more realistic target launch date for Exploration Mission-1, or EM-1, the name of the first combined flight with the Space Launch System and Orion spacecraft. “We agree with the GAO that maintaining a November 2018 launch readiness date is not in the best interest of the program, and we are in the process of establishing a new target in 2019,” Gerstenmaier wrote in response to the GAO report. 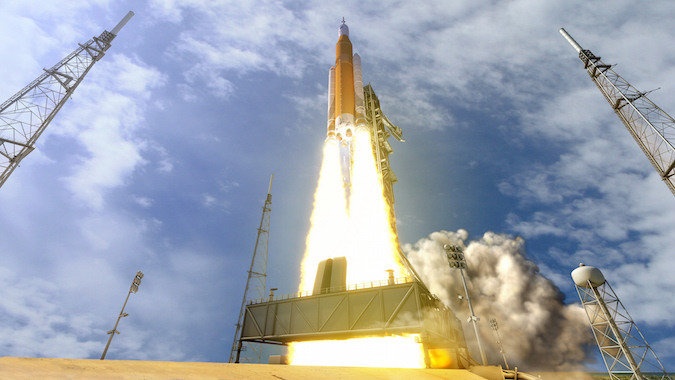 The government watchdog, which also expressed concern over low cost reserves in the SLS, Orion and ground system programs, urged NASA to inform Congress of the new schedule and the delay’s cost during budget deliberations in the coming months. If NASA waits until after lawmakers write the space agency’s 2018 budget, it “would increase the risk that both NASA and the Congress continue making decisions potentially involving hundreds of millions of taxpayer dollars based on schedules that may no longer be feasible,” the GAO said. 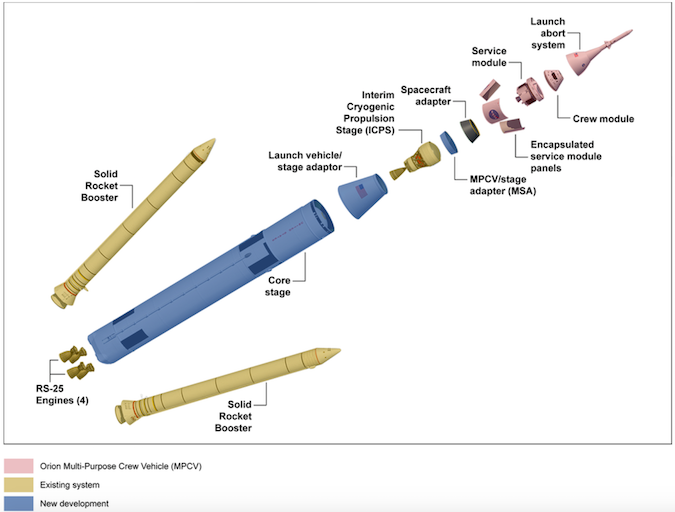 The EM-1 flight profile calls for the Space Launch System to send the Orion capsule on a journey into lunar orbit and back to Earth lasting more than three weeks. “NASA is assessing the EM-1 schedule in light of a number of ongoing activities including assessment of the potential for flying crew on EM-1, the impacts of damage caused by the tornado that impacted Space Launch System’s core stage production at the Michoud Assembly Facility in Louisiana on Feb. 7, and the ongoing FY2018 president’s budget formulation process,” Gerstenmaier wrote. He said that NASA aims to complete the schedule assessment by Sept. 30. NASA intends to launch EM-1 without a crew, but the Trump administration in February directed engineers to evaluate whether the mission could carry astronauts, even if that means the launch will face a further delay to ready the vehicle for passengers. Exploration Mission-2, expected to launch between 2021 and 2023, is currently set to be the first piloted mission to fly with the Space Launch System and Orion capsule. A final report on the possibility of adding a crew to EM-1 is expected to be submitted to NASA Headquarters in the coming weeks. 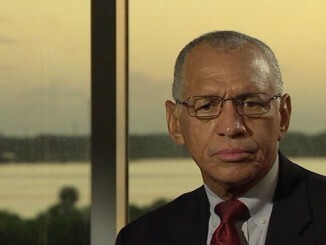 Senior NASA leaders, including acting administrator Robert Lightfoot, received an interim briefing on the study March 31. By the end of the next fiscal year on Sept. 30, 2018, NASA will have spent $23 billion on the SLS, Orion and associated ground systems, with $15 billion of that investment coming since 2012, according to the inspector general report released April 13. The internal agency watchdog also highlighted low budget reserves as a concern. NASA kicked off the design and development of the Orion crew capsule in 2006 under the auspices of the Constellation program, a Bush-era initiative to return humans to the surface of the moon after ending the space shuttle program. President Obama canceled the Constellation program in 2010, citing cost overruns and delays after an independent panel found the moonshot effort to be unsustainable. A year later, the Obama administration and Congress settled on a new path for deep space exploration, salvaging the Orion program and starting work on the new heavy-lift Space Launch System, establishing a long-term objective of sending astronauts to Mars. The SLS will be the biggest rocket in the world when it debuts, towering 322 feet (98 meters) tall and generating 8.4 million pounds of thrust at liftoff, 10 percent more power than the Saturn 5 moon rocket. Four space shuttle-era RS-25 main engines and twin solid rocket boosters provided by Orbital ATK will supply the liftoff thrust. In its maiden flight configuration, named Block 1, the heavy-lifter will be able to haul up to 77 tons (70 metric tons) of cargo to low Earth orbit, more than double the capacity of the most powerful launcher flying today — United Launch Alliance’s Delta 4-Heavy. The Block 1 version of SLS will fly with an upper stage propelled by an Aerojet Rocketdyne RL10 engine, based on the Delta 4’s second stage. SpaceX’s Falcon Heavy rocket, scheduled to make its first flight later this year, will come in just shy of the SLS Block 1’s capacity if the commercial space company gave up recovering its booster stages. NASA plans to introduce a bigger four-engine second stage on the EM-2 launch, a configuration of the SLS named Block 1B. An early version of the Orion capsule, manufactured by Lockheed Martin, flew in Earth orbit in December 2014, launching on a Delta 4-Heavy rocket to test the craft’s basic functionality on a four-and-a-half hour unpiloted mission. That test flight did not include an operating service module, which will carry rocket thrusters and electricity-producing solar panels on future Orion missions. The European Space Agency was supposed to deliver the Orion spacecraft’s first power and propulsion module to the United States in January, but the shipment of the EM-1 flight unit — built by Airbus Defense and Space — is now expected no earlier than September. Once the service module arrives in the United States, engineers will connect it with the Orion crew module and put the combined spacecraft through environmental tests in a chamber at NASA’s Plum Brook Station in Ohio before returning it to Florida for final launch preparations. 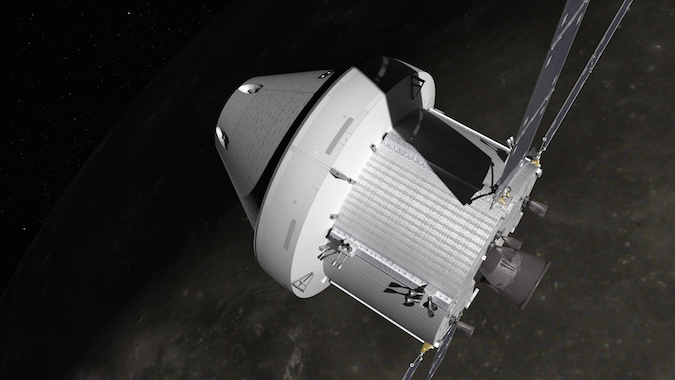 The assembly and testing of the Orion spacecraft will take about 12 months after the delivery of the European service module, the GAO said. Only then can the Orion spaceship be fueled and hoisted atop the Space Launch System. 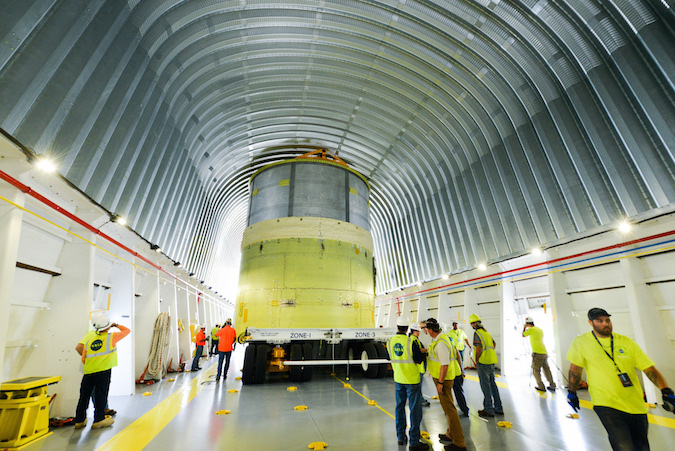 Fabrication of the Space Launch System’s 27.6-foot-diameter, 212-foot-tall (8.4-meter-by-64-meter) core stage at the Michoud Assembly Facility in New Orleans has also encountered difficulties. 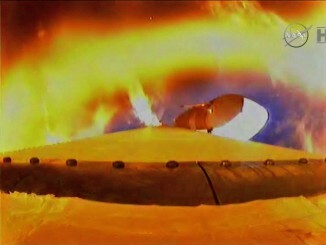 According to the GAO report, welding on the core stage was halted several months to investigate an issue with lower-than-expected weld strength in the rocket’s liquid hydrogen and liquid oxygen tanks. Welding resumed earlier this month after engineers verified the welds were within specification. Boeing has a NASA contract to build the SLS core stage. No major injuries were reported from the tornado that damaged Michoud on Feb. 7, but the storm set back welding on the SLS core stage another two or three months, said Bill Hill, Gerstenmaier’s deputy in charge of exploration systems. Development of Orion’s European-made service module and the SLS core stage are “neck and neck” in the critical path for the EM-1 launch date, Hill said March 29, meaning both components are driving the schedule. Technicians will install four RS-25 engines, left over from the retired space shuttle program, to the base of the core stage before transporting it to nearby Stennis Space Center in Mississippi for its first fueling and hotfire test. Watchdog officials also identified waning schedule margin in preparing ground systems at NASA’s Kennedy Space Center in Florida for the SLS/Orion launch campaign. A new mobile launch platform will ferry the Space Launch System from the Vehicle Assembly Building to launch pad 39B. NASA has shuffled the order of some tasks leading up to the EM-1 launch to make up for lost time, but the GAO concluded the efforts were likely not enough. “By continuing to work toward this deadline, these programs are positioned to make potentially risky decisions in attempting to meet a schedule that is likely unachievable,” the GAO said of the November 2018 target launch date.